There's an extra feature on the 20th Anniversary Edition DVD of Withnail and I that, while ultimately as half-arsed as the rest of the non-commentary featurettes, still struck a chord in this corner of the universe. It involved two of the film's more obsessive fans travelling to the locations at which key scenes were shot and photographing themselves at the exact spots where key characters had stood in the film. To the average filmgoer this no doubt seems the epitome of movie geek behaviour and they may be right. I'll be coming back to this. Back in the early eighties during a period of unemployment, I happened upon a film one afternoon that I had neither heard of nor had particularly high expectations for. A lot of small scale, not-too-well known British films were shown on TV in the afternoons in those days and for all I know may still be. Most were polite, solidly made and largely unmemorable. This one was called Went the Day Well? and it was adapted from a short story by none other than Graham Greene. I was intrigued, in part for the Greene connection, but also because of the question mark in the title. Film titles do not usually pose questions. The film left me stunned. Really. OK, it's not going to have that effect on everyone, but I'd genuinely never seen a film quite like it. Sure, in many ways it could be seen as a typical British wartime propaganda thriller, but there are so many things that... but I'm getting ahead of myself. Let's get back to that opening paragraph. My closest friend at the time was man both brilliant and infuriating, someone I have already (in my recent Blade Runner piece) identified as as my own personal Withnail. It so happens that he paid me a visit the day after my revelatory viewing of this film, and by chance I'd decided to tape it on a recently acquired device known as a video recorder. I didn't usually tape the afternoon films – it must have been that question mark. I showed Withnail the film and he was similarly astonished. As it happened, this particular screening was introduced by critic Leslie Halliwell, a man whose sniffy views of modern cinema frequently drove us both to distraction. Here, however, he was championing a film that he felt had been too little seen, and in the process of doing so revealed that it had been shot in the village of Turville in Oxfordshire, and assured us that little had changed there in the intervening years. Watching this intro a second time, the two of us had ourselves a movie moment, one where the exact same idea hit us both simultaneously. We decided that it would be somehow be fun to travel by coach to Windsor and walk to Turville with huge packs and a tent on our backs. We weren't regular campers and took little in the way of food, figuring we'd get supplies on the way. We didn't see a shop for three bloody days. 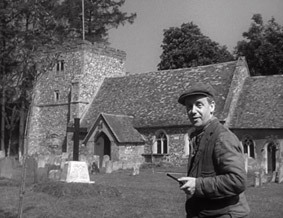 But Mr. Halliwell was right – a few TV aerials aside, Turville was the same village we'd seen in Went the Day Well?. And yes, we did our photographs, with Withnail standing in for the old man who introduces and rounds off the story. It was a trip back in time that I remember to this day. 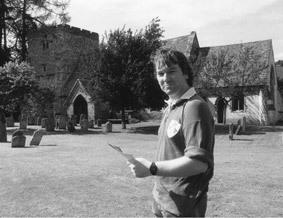 Since then Turville has returned to the screen to provide exterior shots for the Vicar of Dibley. For me it will always be Bramley End. Turville 1942 (left) and 1982 (right). The memorial to the fallen of the Battle of Bramley End is a prop, but otherwise, save for tree growth, the churchyard and other buildings in the village remained unchanged. As you can doubtless see, I was still learning how to choose a lens of the correct focal lengths to achieve specific effects, hence the mismatch of perspectives. If you're new to the film, and I would imagine a fair few of you are, you'll be wanting to know a bit about it. During WW2, a regiment of British soldiers arrive unannounced in the the village of Bramley End for manoeuvres. The locals are initially surprised by their arrival but soon make the men welcome, but all is not what it seems. A number of small incidents eventually alert the locals to what is really going on, that these are not British soldiers at all but German fifth columnists, there to help lay the ground for an invasion force. Once their true identities are discovered they take over the village, imprisoning most of its residents in the local church and holding the rest at gunpoint while they prepare their plans. But the English are not prepared to just sit back and let the invaders have their way, and soon the fight back begins. One of the striking aspects of Went the Day Well? is that it has all the outward appearance of a post-war film but was actually made in 1942, when things weren't exactly going swimmingly for the allies. And yet the introduction talks of a war that has been satisfactorily concluded and Hitler getting what was coming to him. Optimistic propaganda perhaps, but pulled off with conviction and bravado. The soldiers are not your typical wartime bad guys, either. Sure, they commit acts of brutality that no Johnny English would even consider, and in one scene it is suggested that their idea of family values is very different from ours, but they are also organised, intelligent, and speak English as if born to it. There's even a moment in the first half when a non-English speaking German soldier is almost caught out and you find yourself rooting for him, willing one of his comrades to step in and save his hide. Bramley End represents something of an English idyll, a peaceful countryside location where all levels of the class system are represented and the barriers between them temporarily dismantled for the war effort. The character sheet thus includes everything from the landed gentry to shopkeepers, land girls, young London evacuees (led by a 16-year-old Harry Fowler) and even a poacher, all of them prepared to pull together and do their bit when the balloon goes up. A very British picture, you might think, but the director Alberto Cavalcanti was actually Brazilian by birth and only moved to moved to England in 1933 after learning his trade in France. Working first as a sound engineer for the famed GPO Film Unit, then as a short film director for Michael Balcon, Went the Day Well? was his first dramatic feature. Cavalcanti's outsider status and documentary experience clearly enabled him to take a more even-handed and low key approach to what in other hands could have waved the flag from the highest rooftop. For a first time feature director, his handling of character and narrative bristles with confidence, and he and scriptwriters John Dighton, Angus MacPhail and Diana Morgan know just when to reward and frustrate the viewer, but also how to surprise and even shock them. The process of discovery is particularly well handled, a series of small slips and casual observations that point the villagers to the truth just too late for them to do anything about it. The second act has them imprisoned either in the church or their homes, unaware that there is a traitor in their midst and forced to carry on as if all was normal to visitors to the district, who infuriatingly fail to deliver messages of alarm smuggled into their possession. It is in this section that the fight back begins and the first of the very real jolts are delivered, as a German soldier is lulled into false sense of security and then killed with an axe, a shocking and brilliantly filmed sequence that then delivers two more gut punches to audience expectations. 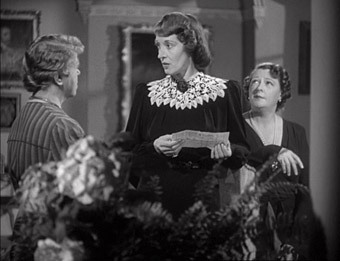 This is a scene that still leaves me reeling, in part for its striking use of camera angles and editing, but also for a directness of violence that was not only rare in war films of the period, but is rendered more disturbing by its domestic setting, a killing committed not by a soldier on the battlefield, but a middle-aged woman in her own living room. Watching this scene is almost like seeing your own mother transformed by circumstance into a killer. Sequences that are dramatic by their very nature are handled with remarkable restraint. Music is used sparingly, and most of the action plays in almost documentary fashion, the final stand-off at the local mansion house having almost no musical accompaniment. 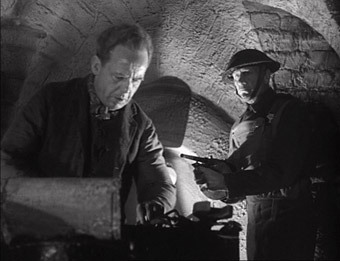 It is this climactic conflict that finds the film in more familiar territory, as the villagers barricade themselves in the hall and do gun battle with advancing German soldiers dressed in British uniforms (which itself must have been an odd sight in wartime Britain). But even here the character interplay inside the hall – resourceful determination bolstered by earthy humour – makes for compelling viewing. It's also here that the film delivers its second serious jolt, dispatching one of the most colourful central characters in a flash when they grab a thrown grenade and run out of the room with it to protect the children within. Once again this stuns on you first viewing but still leaves you reeling on you tenth – this is not the star-spangled heroism of propagandist war cinema, but the maternal instinct at its most acute, a mother figure protecting the children in her charge without a thought for her own safety. Rarely, if ever, will you see this more starkly realised on screen. Like the village in which it was filmed, Went the Day Well? has resisted the ravages of time and the qualities that made it a special film back in 1942 are still clearly evident and eye-opening today. It's one of those films that most seem to stumble across by chance, as happened to me with that TV screening back in the early 1980s. But word spreads, and though it is still rarely discussed in the same breath as some of the acknowledged British wartime classics, it is at least more frequently recognised for the achievement it was and still is and has even earned literary coverage as part of the BFI classics collection. 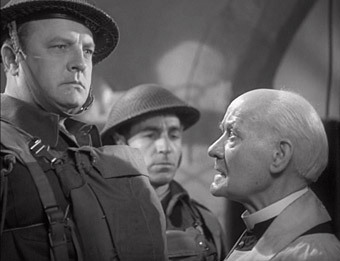 There may be a fair few titles that lay better claim to the title of the best British War Film, but I have no problem in publicly stating that Went the Day Well?, for any number of good reasons, is far and away my favourite. Previously only available as part of an Ealing Classics box set from Warner, the film has recently been released as a stand-alone disc at a very reasonable price by Optimum. Framed 4:3, the correct aspect ratio, the picture quality is generally very impressive, and I'd go as far as to say that the film looks restored and remastered for DVD – there are blemished there, but they appear cleaned up and are never obtrusive. Dust spots are very rare, contrast is very good and the sharpness is impressive for a film of this vintage. A fine job. The mono 2.0 soundtrack inevitably shows its age, but is clear and largely free of distracting background hiss, which is only detectable at all in the quieter scenes. A gem of British cinema that for too long went unseen and uncelebrated is now available for all to appreciate. If you've never seen it then here's one for the Christmas list, and if you know it and love it then have no fear, the transfer on this disc does the film proud. You won't have to look far to find it for under a tenner, which should leave you enough for Penelope Huston's BFI Classics book on the film, a most reasonable stand-in for the DVD's lack of extras.